"This is an Asian twist on rhubarb pie. Sweet and tangy rhubarb is wrapped in a wonton wrapper and fried to make a sweet treat with a nice crunch!" Place the chopped rhubarb into the container of a blender or food processor. Blend until liquefied. Pour into a large bowl and stir in the flour and sugar until smooth. Lay a few of the wonton wrappers out at a time on a clean surface. Keep a small bowl of water nearby for dipping your fingertips. Place a generous spoonful of the rhubarb mixture into the centers of the wrappers. Dip your finger in the water and brush onto the edges to moisten. Fold the wrapper into a triangle to seal, then moisten the inside of the two corners and press them against the top corner to seal. Repeat with remaining wrappers and filling. Heat the oil in a deep fryer or deep heavy skillet to 375 degrees F (190 degrees C). Fry as many wontons as you can at one time without crowding. Turn as needed until golden brown on all sides, about 5 minutes per batch. Use a slotted spoon to remove to a paper towel-lined plate. Serve warm. These were great! Always looking for a new way to use up my rhubarb, and these hit the spot. 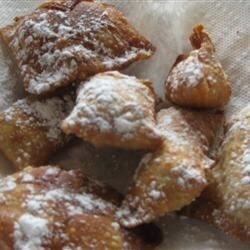 I did put some icing sugar on them, but wouldn't need to as the flavor is great! Made these for a BBQ and everyone LOVED them! I served them sprinkled with powdered sugar and raspberry syrup on the side.